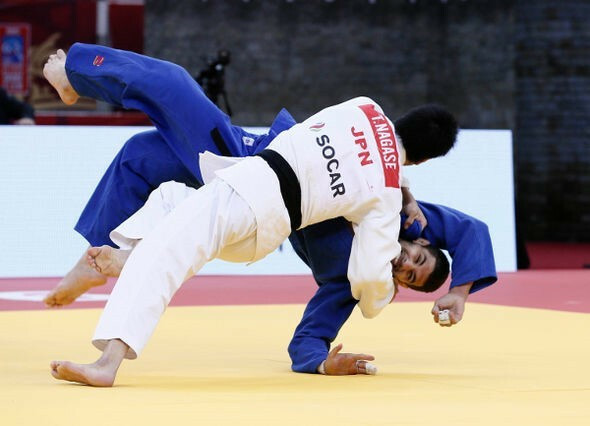 Japan’s world champion Takanori Nagase triumphed on his International Judo Federation (IJF) season debut by cruising to Baku Grand Slam gold in the men’s 81 kilogram event at the Heydar Aliyev Sports and Exhibition Complex. The 22-year-old's last appearance at a Grand Slam event came in Tokyo during December, where he was forced to settle for a bronze medal, but he showed why he is considered one of the favourites for Olympic gold with a series of impressive displays. It culminated in a rapid win over Bulgaria’s Ivaylo Ivanov in the gold medal match, with Nagase achieving an ippon after just 42 seconds of the contest with the European Championships bronze medallist. Italy’s Matteo Marconcini earned the first bronze medal on offer by earning an ippon win over Portugal’s Carlos Luz, before Cuba’s Ivan Felipe Silva Morales replicated the feat against The Netherlands’ Frank De Wit to reach a Grand Slam podium for the first time. Giyosjon Boboyev and Mirali Sharipov clashed in a crucial gold medal contest in the men’s under 73kg division, as both judokas have their eye on claiming the sole spot in the Uzbekistan team at the weight for the Rio 2016 Olympics. Boboyev looked to have the edge in their clash by taking an early lead with a waza-ari score, but his compatriot hit back and was awarded an ippon victory by the judges to boost his Olympic claim. The home crowd had been left disappointed after Azerbaijan’s European and world number one Rustam Orujov had failed to make the final. However Orujov responded by defeating Hungary’s Miklos Ungvari on shido penalties in their bronze medal contest, while China’s Sai Yinjirigala claimed the final podium spot with an ippon win over Ukraine’s Dmytro Kanivets. 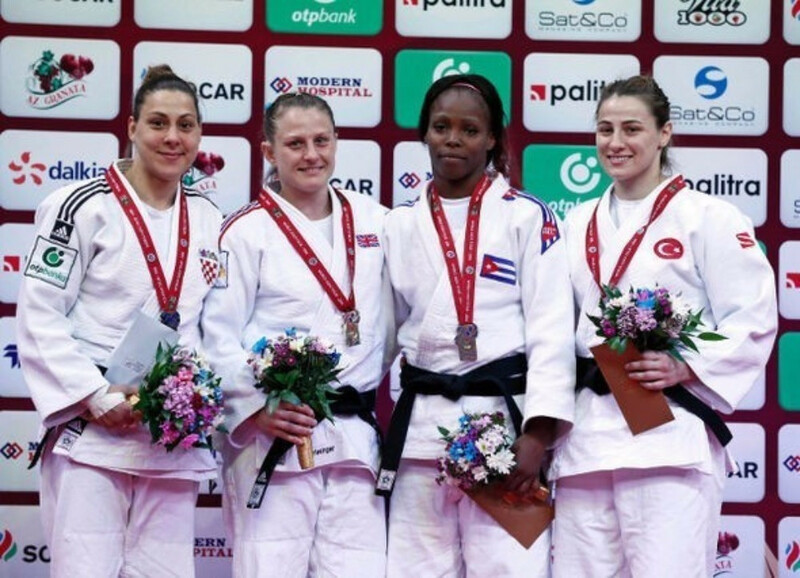 Britain’s Alice Schlesinger proved to be one of the most dominant judokas of the day, as she earned ippon victories in all five of her bouts in the women's under 63kg event to win gold. The final victory came after just 27 seconds against her Croatian opponent Marijana Miskovic Hasanbegovic, who received the silver medal. “I am really pleased with how I fought and focused today,” said Schlesinger afterwards. Cuba’s Maricet Espinosa overpowered Israel’s Yarden Gerbi to claim the first bronze medal with an ippon, with Busra Katipoglu receiving the second after South Korea’s Bak Jiyun withdrew from their contest due to injury. The final title of the day was won by Spain’s Maria Bernabeu, as the World Championship silver medallist sealed an ippon win over Brazil’s Maria Portela in the women’s under 70kg event. Venezuela’s teenage star Elvismar Rodriguez claimed an ippon win over Switzerland’s Juliane Robra to reach the podium, while a waza-ari proved enough to see Puerto Rico’s Marina Perez beat Morocco’s Assmaa Niang to the second bronze. Action is due to conclude tomorrow with the women’s under and over 78kg competitions, as well as the men’s under 90kg, 100kg and over 100kg divisions. To watch all the latest action and interviews on Judo TV click here.